These color notecards are from John Ruthven ’43. They depict the famous “Mother Tiger” print that hangs in the lobby at Withrow today. Mr. Ruthven is best known for his detailed paintings of wildlife. He was awarded the National Medal of Arts in 2004. The notecard is in color on white paper and is provided ten to a box with 10 envelopes. Each notecard is 4.25 inches wide by 5.5 inches tall. Send Ruthven’s “Mother Tiger” to your friends in your next note! 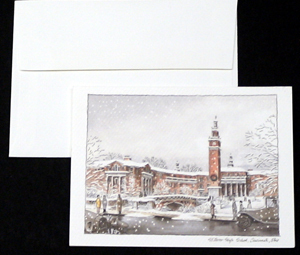 This lovely notecard reminds us all of the special beauty of the Withrow campus on snowy days. It is a gift from the architects who completed the major renovation of Withrow recently. The notecard is a watercolor on white paper and is provided ten to a box with 10 envelopes. Each notecard is 6.25 inches wide by 4.5 inches tall. Put a reminder of the beauty of Withrow’s campus in the winter in your next note to a friend! !